Saturday dawned revealing a Christmas card landscape of heavy frost and snow-tipped Lakeland mountains. Driving north on the M6 over the mist cloaked summit of Shap, England’s highest motorway route, the hill fog cleared to display a sugar coated backdrop of Kidsty Pike and the surrounding fells slipping into Haweswater below. Destination Carlisle. A group of students from the University of Cumbria Students’ Union Volunteer unit are meeting on the banks of the river Eden to continue restoration and reclamation of a quiet corner of Eden park now thick with overgrown laurel, brambles and ivy. The combination of years of neglect and the consequences of unbridled nature reoccupying its former territory. Russell Maddams is in charge of the project, a real community endeavour pulling together a voluntary workforce from Stanwix , the broader reaches of Carlisle and now as far afield as Lancaster. Russell’s approach is what politicians and white collar managers like to call multi-agency community engagement, but it’s rare to find people like Russell who’re less interested in the politics and more committed to working with people who want to improve the places where they live. He concedes the park has been allowed to degenerate almost beyond viable repair. A lengthy process of grant applications for funding to fix original stone buildings and replace the oak trellis sheltering the walkway has hampered progress. None of this seems to matter to Amy. She’s a photography student at the University of Cumbria and joins the group without any previous experience in gardening or volunteering. She says, ‘It’s a beautiful day and I wanted to do something a bit different with it.’ Amy has recently moved to Carlisle from Suffolk. She likes the city and the University of Cumbria campus and looks to be enjoying the course. Rayner has travelled from the Lancaster campus, leaving unfashionably early to join the project in Carlisle. He’s a final year social sciences student who wants to teach. For him the project offers a chance to do something worthwhile. “I think employers like to see that you’re happy to do stuff that’s not part of your job and you’re not getting paid for” he says. “I think this is a great project and a chance to make the park better so everyone can enjoy it for years”. The highlight of the day is the felling of two unwieldy trees at the border of the park. Russell issues the instructions but it’s Rayner who topples the second lofty laurel sending it crashing to the undergrowth with a satisfying creak and the accompanying shouts of ‘timber’ from spectators. 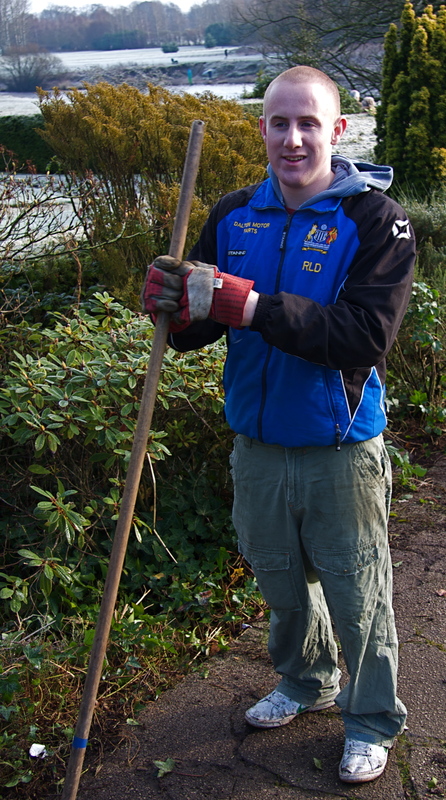 The University of Cumbria Students’ Union President ‘Potter’ joins the team after lunch. He’s travelled up by train after a previous engagement in Manchester and soon gets stuck in, sawing branches off the fallen trees. He’s delighted with the progress on the project and he’s absolutely passionate about volunteering. “I think volunteering is a really important thing for students to get involved in. We have so many projects they can do and are constantly being approached by organisations, community groups and charities who really need help which I think we can provide”. When he’s pushed on why he does it he’s absolutely clear. ‘It’s the right thing to do. And when there are projects like this one, it’s a real blast’. It’s appreciated too. Mr Mackaye is 90 years old. He lives in Stanwix just above the park and walks here most days. He’s delighted to see young people digging, sweeping, chopping and sawing. He’s amazed that some of them have travelled from Lancaster to help and will be enthusing about the volunteers at the next local council meeting where he’s a regular. As the sun sets, the team pitch the last of the garden waste onto Rusell’s council van and start drifting home. As they do, they should all feel good. Good about the work they’ve done. This small part of the park has had the ‘groundforce’ treatment and is visibly transformed. They should feel good about themselves too. Volunteering has that effect. It serves as a timely reminder that there are still people prepared to help out in the community by giving a little bit of their time for free because they want to make it better for all of us. And if everybody felt like that……..
Arnold and Irene are sorting copious pairs of yellow gloves, plastic bin liners and aluminium litter picking devices doling them out to the growing throng of people spilling across Holgates campsite car park. It’s a crisp clear morning with a summer blue sky except it’s autumn and the bitter cold wind slices through our jackets and trousers to remind us winter will soon be here. Irene passes round a clip board, politely asks us to read the safety briefing and sign in. This is a highly organised activity that’s already a world away from the popular ‘eco warrior’ image of Swampy. Hopefully, no one will be expected to lie down in front of any bulldozers this morning. I’m a beach clean virgin. I’m evidently not alone. Kim is a student at the University of Cumbria. She’s here because UCSU Volunteering posted a message on Facebook asking for beach cleaners. She’s a beach clean virgin too. She also concedes that whilst she has been awake before 8:00 o’clock on a Saturday morning she’s not hugely experienced in this area either. None of this seems to matter as we listen to Arnold’s plan of action before heading a few hundred meters down the lane to one of Silverdale’s most picturesque beaches. From the stony shoreline, Cark glistens in the sun a dozen or so miles across Morecambe Bay. Limestone cliffs shelter us from an easterly wind and the sun soon warms most of the litter pickers enough to prompt some to peel off a layer or two. Like Kim, Pazy is studying at the University of Cumbria. A former member of the Royal Navy he tells of a motorcycle accident that encouraged him to radically rethink his priorities. He wants to be an actor now and his easy manner with people will doubtless make him a good one. This morning, Pazy is a beach cleaner. He’s scrabbling between the stones collecting plastic bottles, rope, old balloons, cotton wool buddies and tin cans and dropping them into the plastic carrier he shares with Kim. Their bag is filling quickly. Fumbling through debris I can’t help but wonder what would happen if people like Arnold and Irene of the Morecambe Bay Trust and their band of volunteers – teachers, admin assistants, students, children and pensioners – ordinary folk, didn’t care enough to do such a menial task. How long would it be before the rubbish we dump in the sea ends up back on a beach like this one? At the final ‘weigh in’ we’d collected 49kgs of rubbish. The Morecambe Bay Trust record that salutary statistic. It’s sent to the environment agency. They’re charged with monitoring all the UK’s beaches. Their reports inform government policy and help police the amount of rubbish ships are allowed to dump at sea. Our sacrifice of a single beautiful morning cleaning at Silverdale beach might even make a difference. …….. So we are eco warriors after all!